The women’s race was located at Cattle Country Adventure Park, between Gloucester and Bristol, hosted by promotion rivals Gloucester AC. After heavy rain, the course, which had been described as “ranging from boggy to firm” had to be rerouted because of flooding in one of the water meadows. It seemed that all the mud (and countryside aromas) we’d been missing out on this season had been saved for this last race of the season and an extra kilometre made for a race that suited the endurance runners in the field. Team Manager, Rhian Littlewood’s call to arms saw 18 runners take on the challenge, including the welcome return of Caroline Harlan-Marks and a debut for newcomer Kate Green. Unfortunately after three wins in the season so far, Nic Sykes was ruled out of racing as a precautionary measure having tweaked her calf earlier in the week. We had plenty to be proud of in this last race, with seven runners in the top 50, sixth place overall and a fantastic third place for the team in the Masters race. The scorers for both categories were Lorna Al-Ani (24th overall and 10th in the Masters race), Monica Baptista (28th and 12th in the Masters), Laura Gale (38th and 17th in the Masters) and Caroline Harlan-Marks (45th and 20th in the Masters). 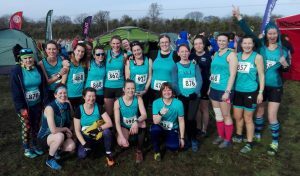 The team spirit before and afterwards was second-to-none, plenty of support for each other, a bit of teal warpaint and our now traditional “Beat the Vest” updates from Laura Gale. Support from Dave Ellis and Áine Garvey more than matched the local cheering for our rivals, and welcome shelter from the elements was provided by ‘Team McManus’. After the race and three cheers for Rhian, we enjoyed a stop off at Gloucester services (worth a visit) and some well-deserved cake! Finishing in fourth place overall in the league we were just outside the promotion places yet showing huge potential for next season. Up in Weston Coyney, Stoke-on-Trent, the Men’s Division 2 Race was hosted by Trentham. With a handy 84 point lead over their nearest rivals in the league, the Bournville men were out for another win to close out a tremendous season after all the hard work in training. The course wasn’t suitable for spikes, with hard rocky ground and trails, and mixed reviews from our 23 runners! Nevertheless it was a very successful run with yet another third place for Henry Brocklehurst leading the ‘A’ team to another win with just two places in it in the final race. The rest of the scorers, Harry Thorpe (13th), Mat Pollard (26th), Chris Collins (28th), Kevin Morris (32nd) and Paul Thompson (38th) finished in the top 40 in a highly competitive field. 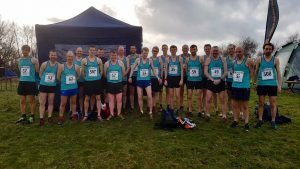 The ‘B’ team, comprising Richard Keep (47th), Iain Jones (55th), Jon Stanforth (67th), Jon Mould (68th), Grant Whigham (75th) and Tom Bunn (84th) had 30 places over their nearest rivals again showing the strength in depth that has been the trademark of a superb season. An 86 point lead at the end of a winter of hard racing and training sees the men’s team rewarded for their efforts with promotion to the first division and great prospects for the next level of competition, but first it’s the Nationals on 23rd February! This entry was posted in Race Reports, x-country by BvH Admin. Bookmark the permalink.